Moving Windows 8 or 8.1 to SSD seems difficult for common users even when they seek help from system built-in tools. However, if they rely on professional software, it will turn as easy as a piece of cake. As time goes by, technology has taken itself off. Especially, computer technology and its related fields have brought themselves on the express train of development. From a micro view, computer data storage disk have upgraded from HDD to SSD to gain higher read and write speed. Also, SSD saves electric power and generates much less noise. Either to improve their experiences using hard disks, or just keep up with the trends (we can’t deny that we have some users who want to catch more people’s eyes), many people have already replace their HDD with new SSD or are planning to do so. And, I believe that among these users, there are not few whose operating system is Windows 8 or 8.1. So, move Windows 8 or 8.1 to ssd is necessary. Windows is a powerful OS brand. It always comes out with a solution for problem related to itself or computer. For this one, it also gives a way out. You can take advantage of system backup and restoration to migrate Windows 8 to SSD. It means that you need to first backup your system and then restore it to new SSD. Between these two tasks, you need a place to temporarily save the system image file and this place should not be small in size. Apart from that, there are many limitations or shortcomings for Windows self-contained backup and recovery. Then, is there a method to easily transfer Window 8 /8.1 from old HDD to new SSD? This is not a new requirement and its solution has already been used for thousands of times. Yes, it is “system clone”, an easy and safe way to help you export Windows system out to other places, including SSD. Compared with system backup and restoration, it only needs one task to achieve the movement and there’s no need of extra storage space. Therefore, clone is the best way to upgrade hard drives. Until here, we know that system clone can help us migrate Win 8 system to SSD. Yet, where can we find the function. Now that it doesn’t be included by Windows itself, it must be a utility of a third party software. As we all know, 3rd party programs are always remedies to Windows. Still, there are many programs which contain system clone feature; which one should we choose? Actually, it all depends on you. Searching the Internet and referring to media/user comments, you will find Free AOMEI Backupper Standard is a good choice. With its intuitive user interface and easy operations, you can quickly transfer Windows 8 as well as applications/data on system partition to your new 1TB Seagate SSD, for example, without any problem. Of course, this software supports all brands of ssd, Seagate, Western Digital, Samsung, etc; all sizes: 240gb, 512gb, 1tb or more than 2tb. And, apart from Windows 8/8.1, it can also clone Windows 7/XP/Vista and the new released Windows 10. 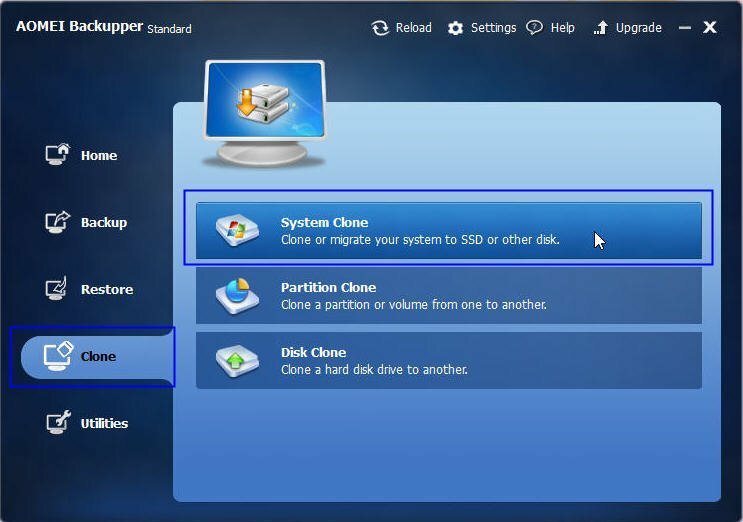 Besides system clone, it can also clone the entire disk or specified partition, backup and restore system/disk/files/folders/partition, manage backup images, start client computers within LAN from network, move system from one computer to another with different configurations, etc. If you want to know detail steps for system clone, please refer to the following articles. Note: Many people are confused by what feature to use for system migration, system clone or (system/ C:) partition clone. Actually, it depends on your system, if your system is installed on C partition and there’s a system reserved partition (some Window 7 systems, Win 8 and its later systems), only system clone can completely move your system to new place; otherwise, the moved system may not work. If your system is other version, both system clone and partition clone are OK. Essentially, the key is whether you clone all the files and data of a system or not.